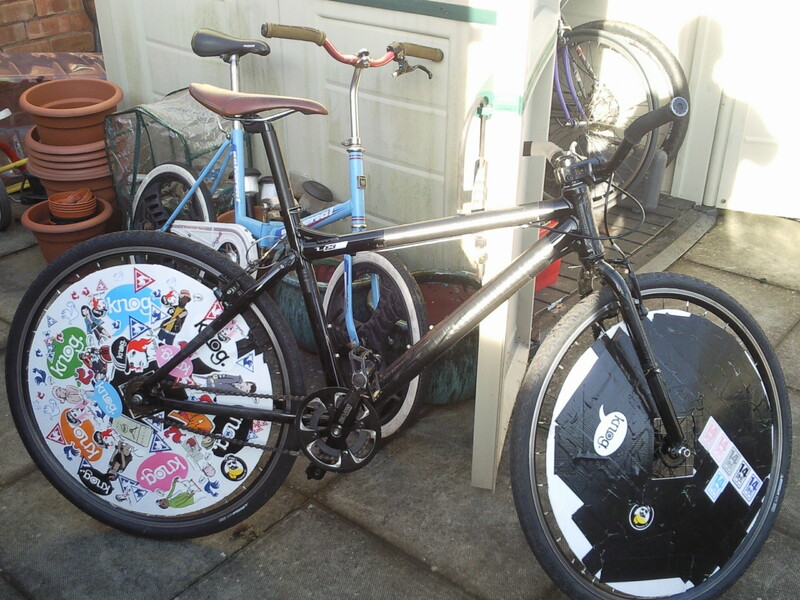 BIKE CHECK – NEIL | Birmingham Hardcourt Bike Polo, UK. This is my second polo bike, after playing for a while on a 20inch mountain bike I decided to try something with a shorter top tube, hoping it would make me a bit faster. Although the mountain bike was pretty indestructible (the 26inch wheels had massive 2.5 inch tyres protecting them), I was keen to try 700c wheels to see if the larger size helped my goalkeeping skills. I bought the Carrera from ex-polo Durham jetsetter Speedy Pete, and in its first session a shot from Andy ripped a spoke from the front rim effectively ruining it! A temporary fix with a washer lasted long enough for me to acquire an NOS BMX hub and a tough 48h rim from Dan and a new wheel was born. Since the photo was taken I’ve changed the bars to some flat ones (which necessitated changing the stem) and swapped the saddle for a Selle Italia Turbo. This new bike seems faster than my last, and with the new beefy front wheel as tough as the old one too. I expect the cheap Halfords stuff to break slowly but surely (like the front wheel) and plans are afoot for a 48h rear wheel to match the front. Rear Stock 36h, 22 tooth Dicta freewheel. Shorter top tubes make people go faster? Huh.